Lost Cities is a addicitve 30-minute card game where the 2 players try to find distant lost cities by mounting expeditions. Mounting an expedition is expensive, and your opponent is trying to foul your plans, so agonizing decisions will fill the game. In fact the theme is fun, and beautfully rendered on the 60 cards and small discard board. But it is ultimately secondary to a simple card game mechanic. The mechanics are simple, but they create a wonderful interaction between the players. Every time you play a card, you'll have to take into account your own position, your opponents position, the size of the draw pile, the probabilities of drawing needed cards and a host of other factors. Most people will be able to start playing Lost Cities within 5 minutes. The tension in this card game doesn't come from a lot of quirky rules and exceptions to those rules. You have a simple goal: play cards in a suit from the start of your expedition (rank 2) to the final destination (rank 10). You can skip ranks, but you can't backtrack your expedition. So you can play the 2,3,5 towards a destination, but then no going back to the rank 4 card; it's a dead card (but maybe not for your opponent?). Starting on one of these expeditions is expensive: 20 points! So you have to make sure you will accumulate enough points to make it worth while. So, for example you play 3, 7, 8, 9 towards a suit, you get 3 + 7 + 8 + 9 - 20 = 7 points. But if the game ended before you could play the 9, you get 3 + 7 + 8 - 20 = -2 points! You can see that starting an expedition is not done lightly. You can multiply your rewards (and losses!) by playing "investment" cards which double, triple or quadruple the final value of your expedition. The catch is these investments must happen before you play your first card of that suit. You can't stop in the middle of the Sahara to do fundraising! So, that was easy: Lost Cities really is a game you can teach to Mom in about 5 minutes. To give you an idea of the real game play, here's a typical starting hand. All players start with 8 cards and yours are: 2,4,5 in White; 7, 8 in Blue; 6 in Yellow; and finally a Red investment card paired with the Red 4. What do you do first? You've got a good low run in White, with lots of room for improvement, but without an Investment card it may be hard to make that expedition pay off. Maybe you should wait before starting that... The Blue suit has some higher cards. But with no lower cards, you're really limiting the number of cards you can play.. That Yellow 6 is just dead weight in your hand (at the moment? ); maybe you should discard it while you wait for some other cards. But you're handing that 6 to be picked by your opponent, who may be over there praying for a middle yellow card before starting that expedition. And finally you have an investment card in Red, but with only a 4 to play, you have to bet on picking up at least a couple more red cards to make it pay off. Lost Cities is always presenting you with that kind of decision matrix. It's not much more difficult than a game of, say, Rummy, but the constant tension and reward for correctly figuring the angles is a real pleasure for the players. Who should buy Lost Cities? Lost Cities is a good game for anyone who enjoys more traditional card games. It's like playing Rummy or Golf, but with beautiful original artwork and an interesting theme. Of course everyone needs a few of these small, 30 minute games in their cabinet to act as fillers or side-games. Maybe even 2-3 games after dinner for a couple who like to play together. 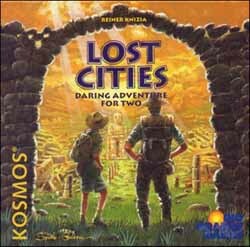 If you're looking for one of these niche games, Lost Cities is a great choice. It'll give you dozens and dozens of fun-filled expeditions. For the daring and adventurous, there are too many lost cities to seek and explore. The search can take you to the Himalayas, the Brazilian rain forest, the ever-shifting sands of the desert, ancient volcanoes and to Neptune's Realm. Of course, one cannot go everywhere with limited resources so the players must choose which expeditions to begin and which to leave to others. Those with high confidence may have the opportunity to up the stakes: increasing the rewards for success, but risking more should the expedition fail. The player who finds the right balance will have successful expeditions. Too many expeditions will put a strain on limited resources and yield failure. Too few may guarantee success, but not victory!